Stephen and I recently went to Auckland to visit with my brother. Usually, I love going to Auckland – I really enjoy seeing my little nieces and hanging out with my big bro (see Birthdays and Such for more on this). So this time, as well is the usual crowd, we were visiting with my mother, who was over from Australia to visit with my brother and meet her granddaughters for the first time. Spending time with my mother is something that requires mental and emotional preparation for me. My mother and I have a difficult history. Let me recount some of it (without airing too much laundry). Remember, family-members-reading-this, it’s just my point of view. Feel free to offer your own POV below. I am the second youngest of my mother’s seven children (my younger brother has a different dad). My mother tells me that she had post-natal depression with each of her children that got progressively worse with each arrival, so I imagine it had reached a fever pitch by the time she got to me. From all accounts, neither of my parents were that excited about my appearance. My parents separated when I was a baby and I lived with my mother until we moved away from Christchurch to Auckland when I was about five. Life was fairly busy between ages 5-10. We moved around a lot, various people came and went, including the rest of my siblings. Honestly, I don’t remember much of it. The next bit I remember very well. 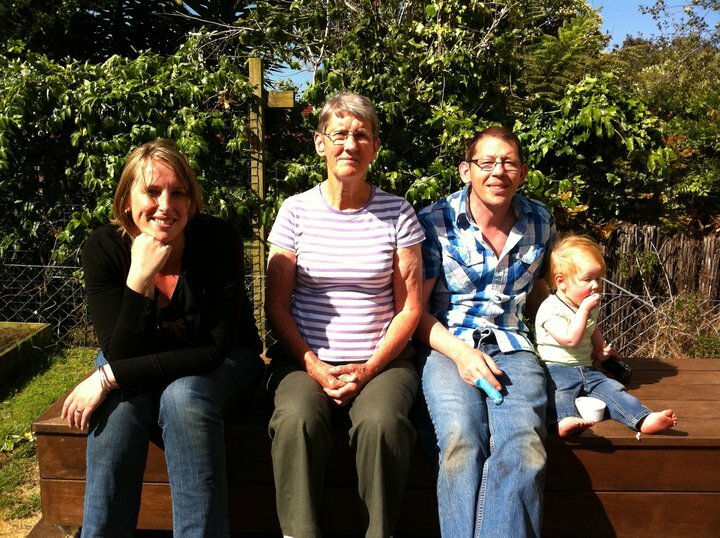 Not long after my 10th birthday, my mother told me that I was being sent back to Christchurch to live with my father and stepmother – people I really only had a passing acquaintance with as far as I was concerned. I was devastated by this. For a lot of years after, everything in my life was measured by before and after this time. It changed everything I knew about myself (and I was only just starting to figure that out at age 10). I felt unloved and unlovable, rejected. By my mother, but also by my father and stepmother who didn’t seem especially interested in me. After I left Auckland, I had limited contact with my mother. I recall her coming to visit with me in Christchurch before she left for Australia, and then a couple of phone calls after that. I guess I was confused and angry, I didn’t want to talk to her. The next time I saw my mother was in 1993 when she came to visit from Australia. I was 20, it had been 10 years. I struggled not to be angry. I had tried to put those 10-year-old feelings behind me in the subsequent years. Seeing my mother and having those feelings bubble up all over again gave me the impetus I needed to deal with them. It took me a few years more, but eventually I made peace with how and why she left. I understood that actually, it wasn’t such a bad deal. She did what she had to, to survive. And she left me with family. And there were some nice people in amongst that lot. So if we move forward a few years, my mother has popped in and out of my life irregularly since then. I like that I see her, but I don’t really have a mother-daughter relationship with her. I call her Albie, not mum. She likes to give me advice about how to run my life, how to be, how to conduct my relationships, raise my kids. This I don’t like. She has no right. I know I’m not alone in this – she bosses everyone around. She is very opinionated. I do my best to ignore it. But it grates. I think my tolerance for my mother is a couple of days every couple of years. After that, I remember why I don’t like to spend time with her and need to get away again. It’s sad really. I would have liked to have a mother, I’d like my kids to have a grandmother, my grandkids to have a great-granny. But at least I have resolved in my head and my heart not to hanker after something that will never be. So when I say I am looking forward to getting married and becoming a Frayle, this might help explain it. It feels like moving on. The wedding plans have been coming along in leaps and bounds lately, with only three months to go until the big day. In case you were wondering, that is 100 days, or 2402 hours, or 144258 minutes. But hey, who’s counting. We have sorted most of the big things now: venue, caterer, menu, band, celebrant, order of ceremony, guest list, photographer. Yesterday we bought the flowergirl and bridesmaids dresses for Bronwen, Grace and Megan. Next week I’ll go to a dressmaker to begin figuring out my dress. Soon we will organise and send out the invitations. We are thinking of waiting until after Xmas to send these (even though this breaks the 3-month in advance rule). An amazing little computer program called Evernote has been helping me along with the planning. It’s a great tool. I can save all the information we send out and receive into it, and then view it anywhere, anytime – from the web, or my home computer, or my iPad, or my iPhone. So the to-do list, all the information from the venue, caterer etc., the dress ideas, the vows-in-progress, the budget, the guest list … everything really … is stored in Evernote. And either of us can update it from anywhere and see any changes that have been made by the other person. Brilliant!